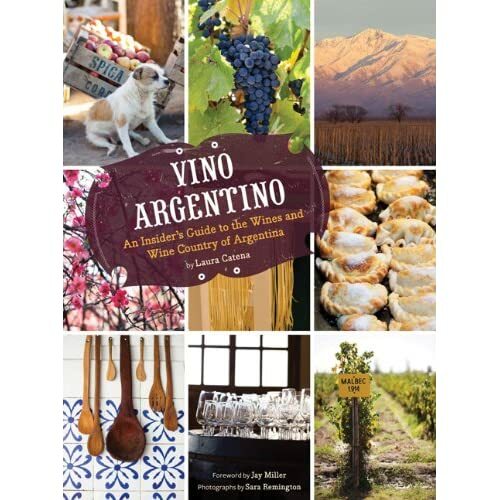 A review of Vino Argentino: An Insider’s Guide to the Wines and Wine Country of Argentina by Laura Catena. (Chronicle Books, 2010.) Photographs by Sara Remington. I’m making plans for some fieldwork in Argentina next year and so I was very pleased when Laura Catena’s new book arrived in the mail. I think it is the perfect reference for anyone interested in Argentinean wine or planning a visit to the vineyards there. Laura Catena is part of Argentina’s most important winemaking family. Her father Nicolás is Argentina’s Robert Mondavi. He helped reinvent Argentinean wine at about the same time that Robert Mondavi was leading the Napa Valley revolution. Laura has been an active member of the family wine business Bodega Catena Zapata (serving as research director at one point) and owns her own winery, Luca, which is named for her son. Somehow she also finds time to be a practicing physician. Mother, doctor, winery owner and now author. too. I think she must have a lot of energy! The first part of the book is a brief history of wine in Argentina, which becomes in Catena’s telling also her family’s history. Not that she claims that the Catena clan go back to the first Spanish plantings, of course. It is just that the Catena family story mirrors so well Argentina’s modern history. Immigrants from Italy, the Catenas followed the railroad to Mendoza and found their calling in the vineyard and cellar. Starting with her great-grandfather, Catena shows us how the family business and the Mendoza industry evolved. At first bulk wines were shipped to the big cities where they were often bottled and sold by local firms under their own labels (the same pattern as California in the 1930s). This eventually made way for a greater focus on winery brands. Nicolás Catena was a leader in developing branded wine in Argentina and implementing effective national marketing programs. Fifty years ago Argentina’s per capita wine consumption was among the highest in the world — its Old World immigrant roots clearly showed — but like the Old World its wine drinking culture has changed and domestic consumption has fallen dramatically. This problem inspired Nicolás Catena to look upmarket for higher margins and abroad for export sales. The change from an inward focus on bulk wines to outward strategy created the need for better quality. Much of the “family history” presented here is the successful and on-going quest to make world class wine. Wine may be sold in bars, restaurants, supermarkets and elsewhere, but it is made in the vineyard, so any book about a wine region must get down to the dirt. Vinos Argentino does this in an unusual but very effective way. We go on a tour of the main wine areas in Mendoza, Salta and Patagonia. The discussion once again is very personal. It is as if you are walking through the vineyard with Laura Catena and she is telling you all about it in the way a conversation naturally evolves. First she might talk about the terroir— the soil and climate. And this reminds her of the types of grapes that are grown here and their history in Argentina. This makes her think about the history of the region and her friends and colleagues who made that history and make wines today. The path of the conversation is sometimes not very straight — just like an actual conversation — but there is much to be learned in the meanderings and I find it perfectly charming. The occasional wine tourism references (eat there, go to see this) are quite as welcome here as they would be on a stroll through the vineyard. The last part of the book provides tourist tips for Buenos Aires and some Argentinean recipes, too. I learned a lot from Vinos Argentino. The first lesson is how much the wine industry has been affected by the economic cycles of Argentina generally (and how much the economic uncertainty that continues today conditions this sector’s future). You can’t really take wine out of the context of the broader political economy and society — a fact that is as obvious as it is easy to forget. Perhaps because of this, international (notice that I didn’t say “foreign”) influences have been unusually important in Argentina. As you walk the vineyard with Laura Catena a great many of the wineries she tells you about have international linkages, some going back 50 years. Catena says that about 45% of Argentinean producers are internationally-owned or use international partners or consultants. International wine-making expertise is part of the story of course (Michel Rolland and his Clos de los Siete project appear in the Uco Valley chapter), but really I think the issue is capital. Argentina’s economic cycles make investment funding very difficult and international interests can bring needed capital as well as technical expertise and international marketing and distribution connections. The final lesson was about the Mendoza terroir. There are several distinct wine regions located within Mendoza and, like New Zealand, Argentina does not have a detailed appellation system that adequately reflects the diversity of its terroir. This might not have mattered much in the past, especially since the tradition was to blend using wines from throughout the regions. But I think moving beyond Brand Mendoza to exploit the individual terroirs is important if Argentina is to avoid Australia’s fate (they are desperately trying to rebrand themselves in terms of regional diversity now). Walking the vineyards with Laura Catena, I think I got a pretty clear sense of the shape and feel of the land and true diversity of the wines produced. It made me optimistic about Argentina’s wine future and curious to try more of the wines (especially her Luca Pinot Noir). If that was Catena’s purpose in writing the book, it worked. I hope it enjoys a wide readership. Dozens of color photos by Sara Remington give a real sense of the faces and places. I wish there were more detailed maps, but I guess that’s what I have my wine atlases for. You should read her book because she is totally HOT!